Michelle McFadden-DiNicola, a Sanders delegate from New Jersey, has come out several days to protest at Edison Research. She said she was “devastated” when Hillary Clinton received the Democratic presidential nomination. But when it comes to exit poll data transparency and election fraud, it goes further than preferential candidates, she said. “Everyone wants to vote their conscience, but I find you also have to balance reality,” Creter said. Other Sanders’ delegates were more reluctant. “I am not strictly ‘Bernie or Bust,’ but I feel very strongly that (Clinton) is threatening me with Trump rather than trying to earn my vote, and I will not let myself be held hostage to that,” said Jeff Epstein, a Maple Shade resident who ran for Burlington County surrogate in Sanders’ column during New Jersey’s June primary. Like Creter, this is Epstein’s first time participating in the convention as a delegate. He said he plans to share his experiences and the behind-the-scenes action via social media. Anne Creter is accustomed to standing on the outside of major political events. The Riverton resident has a long history of attending protests and demonstrations in Washington and other locations, including the 2000 Republican National Convention in Philadelphia and the 2004 Democratic National Convention in Boston. 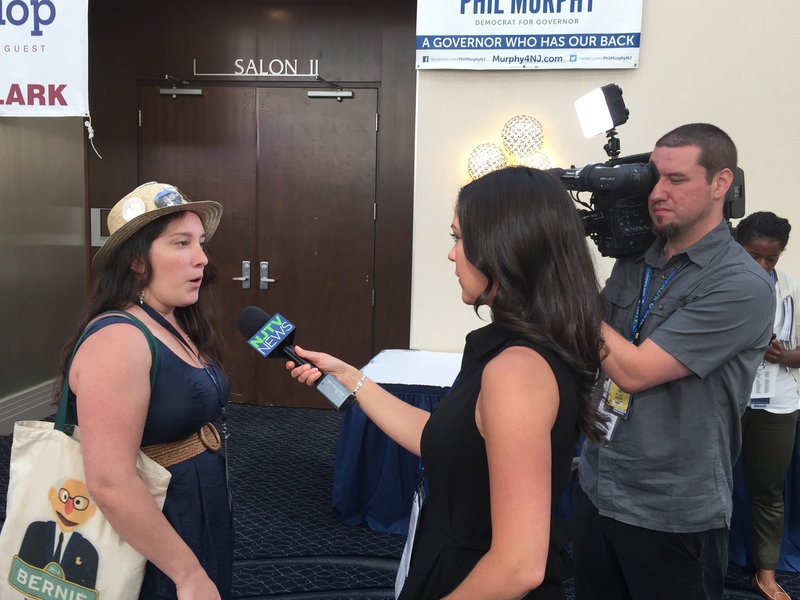 This year’s DNC convention at the Wells Fargo Center will be much different for the local peace advocate, as she’ll be one of New Jersey’s 142 delegates who will vote for the party’s presidential nominee during this week’s convention in Philadelphia. There’s just one tiny hitch. While former Secretary of State Hillary Clinton is expected to be formally nominated as the party’s standard-bearer, Creter is an avowed supporter of Bernie Sanders, the Vermont senator who challenged Clinton in a surprisingly close Democratic primary. Winning over Sanders’ fans is at the top of Clinton’s to-do list for the four-day convention, which is expected to attract thousands of Democratic delegates, press, visitors and entertainers to Burlington County’s backyard neighbor, the City of Brotherly Love. Clinton is expected to formally accept the nomination on Thursday night, closing out the convention. The stakes are high for Clinton, who held just a 3 percent lead over Republican nominee Donald Trump in the most recent Monmouth University poll of registered voters nationally, and a 7 percent edge in 10 key swing states. That poll was taken before last week’s Republican National Convention, which featured nearly nonstop Clinton criticism and chants of “Lock her up!” from the partisan GOP crowds. Sharon Schulman, executive director of the William J. Hughes Center for Public Policy at Stockton University, said Clinton needs to generate similar spirit, as well as party unity. Sanders’ supporters will be key for the latter objective. Winning over Sanders’ supporters could prove challenging. Some, like Creter, enter the convention fairly open-minded, and hopeful that Clinton and the party will adopt some of the reforms Sanders’ championed, such as opposition to the Trans-Pacific Partnership, a proposed free-trade agreement between the United States, Japan, Canada, Australia, Mexico, and several other countries in Asia and South America. Expansion of Medicare and climate change are also big issues. “It’s not that I’m necessarily against Hillary; I just love Bernie better,” Creter said Thursday, citing the senator’s longtime support for creating a Department of Peacebuilding within the federal government. “Our goal is to promote and advance Bernie’s political revolution at and after the convention,” she said. Creter said she hopes the party will find a way to unify around Clinton, although she admitted it may be difficult for many who back Sanders. Another Burlington County delegate, Assemblyman Troy Singleton, of Palmyra, was more optimistic that Clinton will be able to unify and rally Democrats. “We have the most qualified candidate, bar none,” he said last week. A delegate in 2012 during the DNC in North Carolina, Singleton said this year’s convention has more of a historic vibe, as party members look forward to officially making Clinton the first woman presidential nominee. “I liken it to 2008 when Barack Obama was nominated. We have the chance to make history,” he said. Burlington County will be well-represented at the milestone, as the state delegation includes seven residents. In addition to Singleton, Creter and Epstein, the county will be represented by Democratic Party Chairman Joe Andl, of Maple Shade; Mansfield resident Sherryl Gordon; New Jersey Education Association President Wendell Steinhauer, of Lumberton; and Bordentown resident Catherine Majewski. Other New Jersey delegates include the likes of Sens. Cory Booker and Bob Menendez and Reps. Donald Norcross, Bonnie Watson-Coleman and Assemblyman John Wisniewski. Booker, who was among the three finalists considered for Clinton’s vice-president pick, will address the entire convention during the week. While the nation’s attention will likely be focused on Clinton and her contest against Trump, many of the New Jersey delegates will also have their eyes on another political race: the upcoming 2017 gubernatorial election to replace Gov. Chris Christie. While over a year away, jockeying among potential Democratic candidates has already begun, and the so-called shadow campaigning is expected to surge at the convention. Among the Democrats believed to already be jockeying for the party’s nomination are Senate President Stephen Sweeney, Jersey City Mayor Steve Fulop and Philip Murphy, a former Goldman Sachs executive and ambassador to Germany. Each has sponsored one of the delegation breakfasts, where delegates gather before the day’s events. Sweeney is also hosting a Sunday night convention kickoff event on the Battleship New Jersey in Camden. “They’ll be looking for backers, both financially and politically,” Schulman said about the Democrats vying to become New Jersey’s next governor. Singleton said talk of next year’s governor’s race is inevitable, but he hopes New Jersey Democrats are able to keep their focus on Clinton and the task of helping her win the presidency. “I know (the governor’s race) will be on some people’s minds, but the issue in front of us is so important that we can’t afford to have it take a back seat,” he said. There will be plenty to do besides politicking, too, including afternoon and evening receptions and viewing parties at the New Jersey delegation’s hotel at the Philadelphia Renaissance Airport Hotel, as well as scores of parties and events across the city. One of the biggest events will be an invitation-only concert Thursday at the BB&T Pavilion in Camden featuring Lady Gaga, Lenny Kravitz and DJ Jazzy Jeff. The concert was organized and sponsored by George Norcross III, chairman of Cooper University Hospital and a member of the Democratic National Committee, and Susan McCue, former chief of staff to Senate Minority Leader Harry Reid, as a thank-you to Democratic Party volunteers and supporters. There will also be a food truck festival Monday afternoon at 3rd and Arch streets in the Old City section of the city, as well as receptions, cocktail hours and viewing parties hosted by lobbying firms, special interest groups and celebrities throughout the week. Some of the events are invite-only, but many are open to the public and offer the chance to meet and socialize with elected officials, delegates, campaign volunteers and political wonks. Singleton, for one, hopes to find time to enjoy some of the festivities. Creter said she hopes to find some time away from the convention hall in South Philadelphia. She said finding the time and choosing the events is challenging. Staff writer Brian Woods contributed to this story. 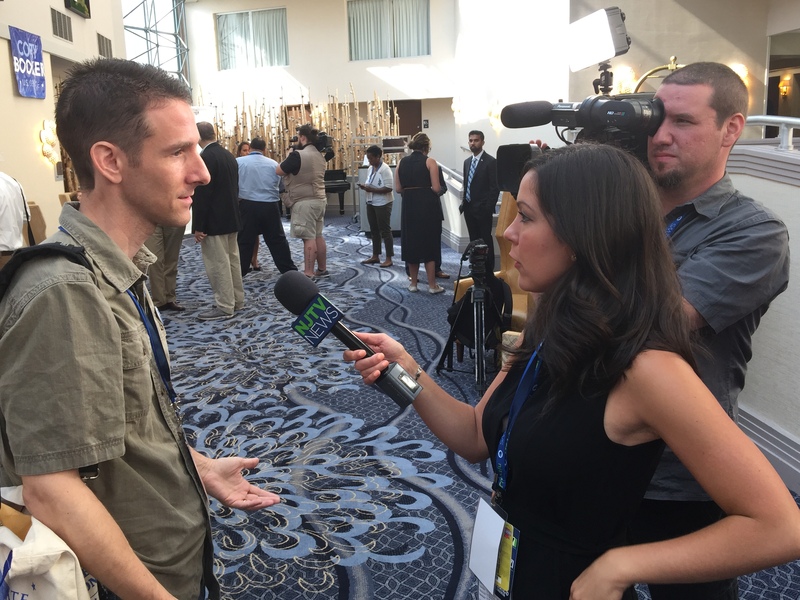 Nuisance: Mon 7/25: Liz Maratea and I are in this NJTV News article and video. Liz is portrayed well. I’m portrayed meh. Liz Maratea, NJ Bernie delegate. Video and article: Sanders Supporters Rally at DNC. “Here it is in black and white that everything that we’ve been saying from the beginning is absolutely 100 percent true. It doesn’t suggest there was corruption. It doesn’t suggest the DNC has been working against Bernie. It proves they have been working against Bernie since the beginning,” said Liz Maratea, New Jersey delegate for Sanders. Even Sanders’ own pledged delegates are split on how to move forward, despite his endorsement for Hillary Clinton. “The whole point of the progressive party, the whole point for Bernie supporters, is we think for ourselves, we don’t do what other people tell us to do. Even if Bernie tells us to vote for Hillary, no we are voting with our conscience. We don’t vote against people. We’re not voting to be against Trump. We’re voting for the candidate that we want,” Maratea said. Will he vote for Clinton? “I’m not Bernie or bust. A lot of my friends are,” Epstein said. Author aliteralmindPosted on July 19, 2016 September 29, 2016 Categories Jeff's DNC, Nuisance: 7/25 MondayTags Interview of me, Newspaper interview of me, People: LizLeave a comment on Nuisance: Mon 7/25: Liz Maratea and I are in this NJTV News article and video. Liz is portrayed well. I’m portrayed meh. Caruso is among those who believe the Sanders and Clinton Democrats will be able to come to the table to shake hands and work together again, as disagreeing Democrats have in the past. But some believe the gap is too big to close. Jeff Epstein, a Sanders delegate from Burlington County, said the celebration over Clinton’s success overpowers the fact that there’s a lack of interest on the part of Clinton backers to really listen to the views of Sanders supporters and make them feel part of the Democratic Party. Epstein said he doesn’t see a way to bridge that divide. “There’s just so much baggage that’s there’s no way around it. If they did what we felt was right, to sit down with us and come to a resolution … the amount that it would take to do that is infinite,” he said. Epstein said he’s not a “Bernie or Bust” kind of supporter, but he has a deal breaker if he is to vote for Clinton. Bernie Sanders supporters wait outside while media is shut in during a sit-in at Tent 2 in the press village moments after Hillary Clinton secured enough votes to deem her the Democratic presidential nominee at the Wells Fargo Center onTuesday, July 26, 2016. As the second night of the Democratic National Convention was underway, mixed opinions swirled around whether supporters of Bernie Sanders and Hillary Clinton would be able to mend the divide that separates them and the Democratic Party. On the floor of the Wells Fargo Center, some DNC delegates held signs that read “Love Trumps Hate.” Others were decked out in pins and shirts and hats with Sanders’ picture. One man was spotted wearing a jacket with “Feel the Bern” boldly written on the back in battery-powered lights. And while some Sanders delegates expressed their distaste for the messages delivered during Monday night’s speeches, the Clinton delegates said they want nothing more then to work together with the Sanders delegates. U.S. Congressman Donald Norcross, representing Camden, Gloucester and parts of Burlington counties, said he believes the Democrats have already come together in the democratic process when they voted for Clinton as the party’s nominee. The Democrat from Camden said he believes each speech that was made represented the core values of all Democrats — a livable wage, pay equality, and creating more domestic jobs. He said that despite the divide between Sanders and Clinton supporters, the next few days will become a path that would lead to a united party. Author aliteralmindPosted on June 1, 2016 August 28, 2016 Categories UncategorizedTags Interview of me, Newspaper interview of meLeave a comment on Coverage of my surrogate candidacy by the Burlington County Times.